This is an easy recipe for a delicious cheese roll. It has the cheeses anthotiro and feta - ricotta could be a substitute for the anthotiro if you can't get it where you live. The recipe is for 2 rolls, which give you 4 pieces each (see photo). We have put olive oil and sunflower oil together as it would be too 'heavy' if it was just olive oil. Also, just add pepper, but no salt as the Feta is salty enough. Crumble the cheese in a bowl. Beat the eggs and add to the cheese mixture, along with the mint and pepper and mix well. Open out 1 sheet of filo pastry and brush with the oils. Place another sheet on top and brush with oil again. Repeat this process until you have 5 sheets, one on top of the other. Place half of the filling mixture along one of the narrower edges of the filo, but stopping 5cm short of the edge at each end. Fold in the 5cm on each side of the filo all the way along (to hold in the filling) and roll the whole thing up into a roll. 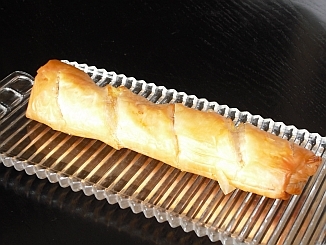 Repeat this process with the other 5 sheets of filo and the remaining half of the filling, to make the second roll. Place in an oven dish and brush on top with oil. Score them on top into 4 sections each, but only superficially, otherwise the cheese will spill out in the oven. Place in a pre heated oven at 180 degrees Celsius for approx. 30 minutes or until it turns light golden brown.